STORServer Appliance solutions offer simplicity, flexibility and scalability with an intuitive user interface that can be easily managed in 30 minutes per day, or less. Automated daily processes can be set to prioritize, schedule and monitor backups. Comprehensive reporting provides graphical depictions of backup status as well as alerts and schedules. STORServer Appliances are easily scalable to give you what you need today as well as grow as your data requirements change. We eliminate guesswork and complexity by offering a single SKU to order and a single contact point — from building, delivering and installing the appliance to on-the-job training. 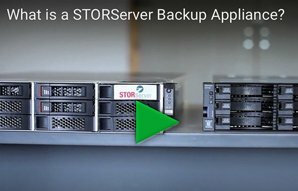 With STORServer’s reputation for proven data recovery and 30-day money-back guarantees, you’ll never worry about data backup, recovery, disaster recovery and archiving again. Unlimited configuration options featuring the broadest range of data management software, disk and tape storage and interconnect technologies for software-defined and hyper-converged data centers. Our data protection experts simplify backup operations by tailoring every solution to your unique application environment whether on-premises or in cloud infrastructures. Built-to-order and ready to go, enabling IT managers to start backing up the enterprise production environment in a matter of hours not weeks. All STORServer Appliance solutions arrive at your data center fully integrated, tested and ready to begin installing clients. Backups begin the first day of installation. Data protection that fits any budget provided by appliances that range from gigabyte to petabytes in capacity, all backed by multiple support options from the backup appliance pioneers. Today’s business moves at hyper-speed and IT managers must deploy the right data protection solutions to securely, cost-effectively and efficiently backup and recover data their business applications generate. Access and recover data whenever it’s needed with backup, restore, archive, replication and reduplication that is unified and easy to manage for multi-hypervisor environments, converged data centers and hybrid cloud infrastructure. Immediately Protect Your Enterprise Data. Easily Expand Far Into the Future. STORServer backup appliances come pre-installed with the industry’s leading data backup and recovery software that is tuned for your specific applications. These powerful systems are designed to easily manage data backup, archiving and business continuity for the most dynamic environments and can scale for years without the risk of obsolescence. Why choose between same old “good-better-best” when your business demands built-to-order? STORServer appliances are engineered to meet your application needs at the time of purchase and are designed to keep pace with your data growth. If you need more capacity, just add more disk without requiring forklift upgrades. Even small initial configurations can grow — without causing data dead ends and silos. Enterprise-class, reliable hardware powered by award-winning software options. The appliances are built and configured by STORServer and delivered to your organization ready to go. STORServer Appliance solutions seamlessly backup multiple operating systems and email applications plus supports most popular database platforms (requires optional database agents). Backups and restores can take place across all network connections (NAS, SAN, LAN, WAN) from hundreds of storage devices. STORServer’s centralized management console allows a single administrator to manage data across the entire enterprise, usually in 30 minutes per day (or less). Automated tape management further reduces the need for dedicated resources while “incremental-forever” technology and built-in deduplication saves additional time and further reduces network impact and media storage costs. Over a short period of time (usually within the first 9 months), these cost-saving features prove to lower annual IT data protection expenditures significantly. Two things your business can rely on are data growth and our dedication to customer service and support. Nobody knows data protection better than the STORServer pioneers who created the concept of the backup appliance and have engineered advances in data protection since the early days of RAID. STORServer appliances are built to our rigorous specifications and your business requirements so you can trust the data, and the support, will be there whenever you need it. All STORServer Appliance solutions are built on the latest IBM® and Lenovo hardware components and are powered by IBM® Spectrum Protect™, IBM® Spectrum Protect Plus™, or Commvault® Software and other heterogeneous technologies. STORServer offers deep storage expertise and trusted support, with a single contact point dedicated to your appliance. Our support team is staffed by senior engineers who resolve 80 percent of support calls the first time. They’re locally based for fast response, which allows them to quickly diagnose issues in your data environment, regardless of the software, hardware, storage or customer operations. 30-day money back guarantee The STORServer data protection solution delivers proven enterprise backup and recovery that just works. All STORServer Appliance solutions are sold with a “30 Day Money Back Guarantee.” If you aren’t completely in love with our technology, we will refund your purchase, in full, within 30 days of delivery. We stand behind our work and products and are willing to stake our reputation on it. You will be satisfied with our solution. Data Recovery Guarantee Select STORServer Backup Appliance solutions are sold with a “Data Recovery Guarantee.” STORServer is the only data protection provider that will make this promise. Low ownership costs over many years of service. Customers may choose to deploy STORServer because of the ironclad money-back guarantees, but they keep the systems for years because of the simplicity, reliability and flexibility. Thousands of enterprise appliances have been installed with many still in use.